In an average workday, your colleagues and employees don’t perform just one task. 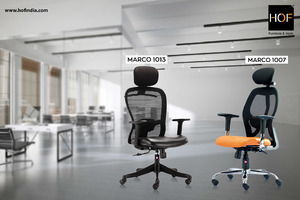 So, your office chairs should be flexible enough to provide them with the required comfort. With all those meetings, conference calls and planning happening in the company, your revolving office chair needs to be as comfortable and flexible as possible. Want to redesign your office? Give Your Office a New Look with Multi-Functional Chairs of HOF. Buy designer multi-functional chairs online from HOF along with free shipping.